Let’s plot it to see how it changes over time. There was a definite shift after Tom Baker towards a shorter term as the doctor. In terms of screen time, the shift is a little less pronounced due to the move from 25 minutes to 45 minutes per episode from Christopher Ecclestone onwards (and for one of the Colin Baker series). Thanks for this interesting chart. It really helps put the Doctor’s tenures into perspective. As you already mention, the episode length nearly doubles in the modern era. You may want to update your graph to reflect this. It would be more accurate. Not more accurate, just a different metric. 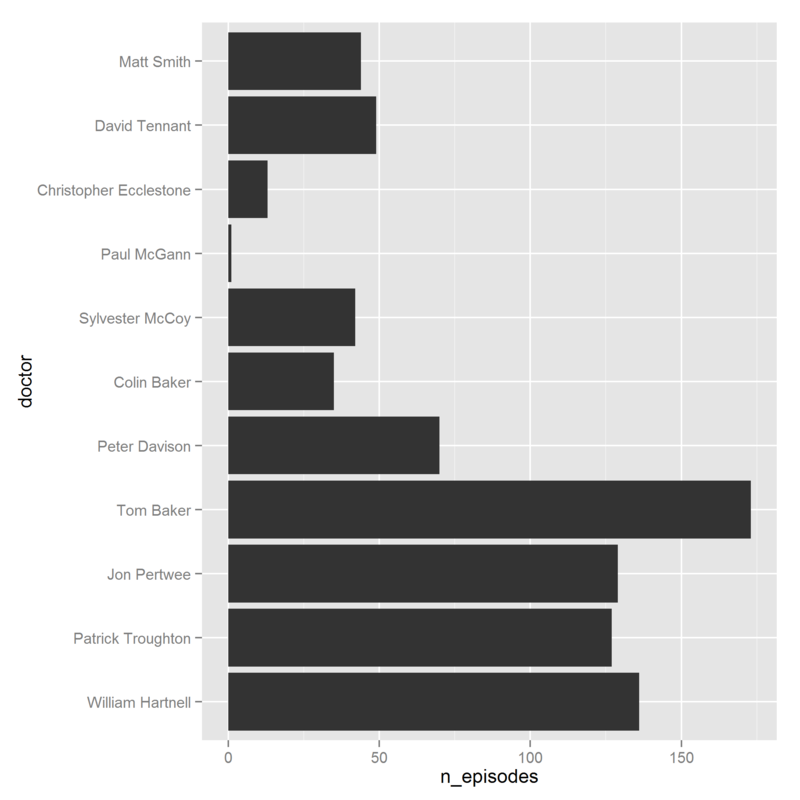 My “solution” to the problem of metric was to use the full length of the episode featuring each Doctor, regardless of how long there were present for. This causes some oddities, at regeneration-time, but it’s easier than actually sitting in front of each episode with a stopwatch measuring screentime or something similar, and fussing about flashbacks, Doctor-Lite episodes, etc. There’s no neat way of doing it, so as long as you’re careful about what it is you’re actually plotting I think it’s fine. Number of episodes is a good metric from the point of view of the viewer, who has to wait a week between each one – a week >> the difference between 25 & 45/60 minutes, so it’s closer to what the viewer will feel perhaps.